Comic books are a magical realm, where anything can happen. Unlike in movies, comics are often free to explore the most bizarre possibilities from all corners of the writers’ imaginations. More often than not, this means comic creators throw together as many popular characters as they can get their hands on. It's good business to throw characters together that no one expects to see sharing a page; companies as adversarial as DC and Marvel have been known to join forces for a good, crazy story. This has led to more than a few fantastic crossover stories over the course of comic book history. We've combed through the back catalogues; here are the 13 Best Comic Book Crossovers of All Time. 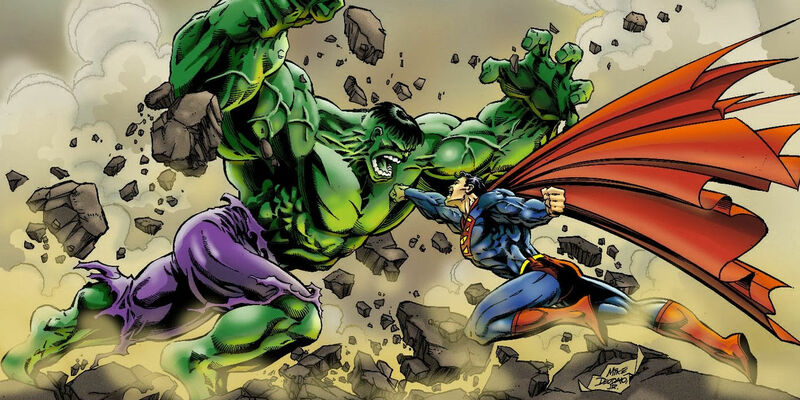 Marvel and DC have been engaging in a friendly rivalry since the beginning of the Silver Age of comics. The two publishers have teased each other plenty over the years, and for many years comic book fans dreamed of seeing their favorite heroes cross over into each other’s stories. What would it be like if Captain America met Superman, or if Spider-Man got in a fight with Batman? Fan fantasies finally came to life in 1996 when a two issue crossover, entitled DC vs Marvel, hit comic book store shelves. This opened the floodgates for a series of crossovers which took place over the next decade, culminating with JLA/Avengers (also known as Avenger/JLA, because comic book companies are best known for overcomplicating things), which saw publication over several months in 2003 and 2004. Arguably the most famous of all crossover comics, JLA/Avengers was actually the result of over thirty years of negotiations between the two companies, as the initial plans had been made in 1979 before plans were put on hold due to editorial differences between Marvel and DC’s higher ups. For a time it seemed as if JLA/Avengers was the sign of more cooperation between the two comics publishers, but there hasn’t been any further successful attempts to unite the two brands since. Some comic book crossovers use characters which comfortably fit together in a similar style of storytelling. This certainly is not the case with Archie Meets the Punisher, a crossover which unites one of the biggest names in light comic book humor with Marvel’s ultra-violent murderous crime-fighting vigilante. When the Punisher sets out to apprehend a notorious drug dealer named Red, who coincidentally looks exactly like Archie, the two characters end up butting heads. After some action and a bit of shooting, the Punisher realizes that the whole situation is a typical Archie-style misunderstanding. With Archie’s name cleared, the two team up to save Archie’s girlfriend Veronica, who is being held hostage by criminals. The comic isn’t meant to be taken seriously and definitely trades off its ludicrous premise for a lot of silly jokes. Add in some cameos from Sabrina the Teenage Witch and Josie and the Pussycats, and this series has probably the most diverse audience in comics. Two franchises which fit together a little neater than Archie and the Punisher are the popular television science fiction shows Star Trek: The Next Generation and Doctor Who. Both deal with extra-terrestrial travel, both feature bizarre time-travel plots at times, and both star respected British actors as their leads. In addition to these similarities, both Star Trek and Doctor Who feature recurring cyborg villains: the Borg and the Cybermen, respectively. So when these two robotic antagonists team up together to take over the planet Delta IV, it’s natural that both the crew of the Enterprise and the TARDIS (in this instance, the Eleventh Doctor along with Amy and Rory) should show up to save the day. These two beloved science fiction universes fit together exceptionally well, and while it’s unlikely that such a crossover could ever happen on television, this comic book story is the next best thing for eager science fiction fans. Speaking of Star Trek crossing over with other perfect science fiction properties, a one-shot comic issue from 1996 showed that it’s not just Doctor Who that fits well with Gene Roddenberry’s universe. While the X-Men are primarily known in their movies for being a grounded metaphor for social acceptance, in the comics, the team of mutants have had more than their fair share of interactions with extra-terrestrial beings and time travel. When the crew of the original Enterprise discover an alien ship which has travelled through a rift in space and time, it doesn’t take long for a firefight to ensue. The alien ship is destroyed, but not before it’s crew – the X-Men – are beamed aboard the Enterprise. The team of mutants explain that as part of their dealings with the alien race, the Shi’ar, the X-Men had been using the rift to explore possible future timelines for their planet, in a plot that’s essentially the reverse of the 2009 Star Trek reboot. As interesting as the combination of X-Men and Star Trek is, there are some moments which even the most dedicated of fans can’t help but laugh at. When the Shi’ar ship is first discovered by the Enterprise, the alien hero The Guardian punches Captain Kirk’s ship, leading the Star Fleet crew to reel in surprise that a being exists which would be foolhardy enough to try such an attack. Also, Spock takes out Wolverine. Alien Versus Predator is perhaps one of the most famous crossover stories in the history of modern popular culture, having occurred repeatedly across video games, comic books, and movies. Similarly, Batman and Superman feature in each other’s comic books with great regularity, and the recent movie pitting the two characters against each other has cemented the pair’s reputation for appearing as a double act. It’s fitting, then, that a comic crossover pitting DC’s finest heroes against an extraterrestrial menace should find room to squeeze in all four of these characters. The story revolves around a crashed Predator ship which is discovered in the Andes in South America. After Batman and Superman discover the ship while looking for a missing mountain climbing team, the two heroes face off against both the Predators and the xenomorphs before working together with the Predators to get both alien threats off the planet, which seems to be a situation that benefits everyone. This period of comics saw a lot of crossovers between the Aliens and Predator franchises – both Superman and Batman had already had encounters with these enemies in comics before the ultra-crossover starring all four franchises. A similar comic story from the same era sees Judge Dredd facing off against the xenomorphs, which is also worth a look for fans of Aliens franchise crossovers. On the opposite end of the Batman comic book crossover spectrum comes his crossover with a franchise which is more commonly aimed at children, without all of the horror elements that Alien and Predator bring to the table. Yet in spite of the Ninja Turtles’ primary appeal to ten year olds, this crossover actually works surprisingly well. Shredder and the Foot Clan fit incredibly comfortably with Batman’s rogue gallery – beating up ninjas is well within the Caped Crusader’s typical job description. When the Ninja Turtles are sucked through a dimensional portal to DC’s Gotham City, they team up with the Dark Knight to defeat Shredder and find a way to return home to their own dimension. One thing that really helps to sell this particular crossover is some absolutely gorgeous artwork – the coloring in particular does a fantastic job of blending the dark grit of Gotham city with the relatively colorful Ninja Turtles, making nothing seem out of place when the two popular franchises mash up together. What’s more, the inclusion of one of the more outlandish Batman villains, Killer Croc, helps to tie everything together and make dimension-hopping mutant turtles not seem as strange as the concept might first appear. The Star Wars comic book line has always provided a diverse range of stories, many of which take advantage of the lengthy history of the galaxy far, far away. At one point, publisher Dark Horse were simultaneously publishing stories that occur 5,000 years before the events of Star Wars: A New Hope; and stories which take place over a hundred years afterwards. In planning a crossover for the various comic book series that at the time made up the Star Wars franchise, in a universe that has never shown any indication of the possibility of time travel, the writers had to get creative. Their solution: a single character who spends an extended period in suspended animation. In the Knights of the Old Republic comic book, a character called Celeste Morne finds a talisman containing the soul of an ancient Sith Lord. In order to keep the talisman from infecting a planet with a mutant disease, Morne is put into suspended animation at the end of the story arc – and awoken centuries later by Darth Vader in the Dark Times comic. From there it’s simple for the character to appear in the Rebellion comic, set a few years later in the timeline, before finally appearing after a hundred years in Legacy, the story of Luke Skywalker’s descendant. This comic crossover does an excellent job of connecting together all of the stories in Dark Horse’s lineup of Star Wars titles from this era, and while each story can be enjoyed by itself, following Celeste Morne’s adventures and progression through all of the comics comes with a satisfying payoff in the end in Legacy. It’s difficult to pick a single issue from Scooby Doo Team-Up which stands out as the best – the entirety of the comic’s run is surprisingly strong for a series built on mashing up a children’s cartoon character and a variety of other Warner Bros properties. Fans of DC comics will likely be familiar with previous times when Scooby Doo has met characters like Batman and Superman. With this comic, though, things go even further – Scooby teams up with Wonder Woman, Aquaman, and the Teen Titans in different issues throughout this comic’s run. Beyond this, though, there are also plenty of other popular brands mixed in for good measure – Scooby Doo meets the Flinstones, the Jetsons, and even the cast of Johnny Quest. All of these comics are filled with classic Scooby Doo charm and humor: while plenty of the other comic crossovers on this list take themselves very seriously and work hard to justify the logic of two unconnected canons meeting up, the crossovers throughout Scooby Doo Team-Up focus more on having fun and being a bit silly than they do on justifying the comics’ places in relative continuities. There are certainly worse places to look for an all ages crossover adventure! A long time ago now, during the height of Beatlemania, it was difficult to look anywhere without seeing a reference to the Fab Four. The world’s most beloved boyband were stars of their own movies and magazines, and were regularly rubbing elbows with other big celebrities of the era. One such popular celebrity of the time was Batman, whose comic was enjoying a fun Silver Age run which involved plenty of odd storylines. In an issue of Batman’s comic from 1970, the World’s Greatest Detective and his sidekick, Robin the Boy Wonder, worked to solve the mystery that was on everybody’s lips: what had happened to Paul McCartney? A popular fan theory of the time stated that McCartney was in fact dead, and that through a series of clues in their songs and album artwork, the Beatles were subtly trying to get the word out that their record label had replaced the popular songwriter with a stand-in to keep the band’s popularity at its peak. For copyright reasons, this story uses a selection of stand-in names to refer to the Beatles. Instead, the band is called the ‘Oliver Twists’ and consists of Saul, Glennan, Hal, and Benji (although, as with the real Beatles, only Saul and Glennan get any of the limelight in the comic). Believe it or not, Sonic the Hedgehog is actually one of the most established comic book brands in the history of the medium: well on the way to its three hundredth issue, the comic is the current longest-running series that hasn’t resorted to returning to issue #1 (as is regularly the case with all books from Marvel and DC). Megaman’s comic brand isn’t quite as powerful, but it’s difficult to ignore the power of the two classic video game icons when thrown together. Both franchises’ dealings with evil mustachioed doctors and a host of deadly robots make this crossover work together exceptionally well. When a chaos emerald from Sonic’s home planet of Mobius is accidentally transported through space and time to the faraway dimension that is home to Earth 20XX, Doctor Eggman and Doctor Wily team up to create all-new robotic creations including the Wily Egg, leading Sonic and Megaman to team up to stop them. Unfortunately, trading off the reputation of the far more popular Sonic comic brand didn’t give the Megaman series the boost in readers that the crossover was intended for. Megaman’s comic book series was cancelled shortly after Worlds Collide, although there have been subsequent crossovers with Sonic again since. The idea of the crossover between multiple versions of Spider-Man might at first glance seem a little unambitious compared to some of the other crossovers on this list, but this comic event deserves its own spot simply for the attention to detail that the series achieves. When a dimension-hopping demon family declares war on all variations of Spider-Man throughout the multiverse, the original flavor Spidey from Earth-616 (the standard Marvel comics universe) is tasked with leading a group of alternate reality Spider-Men to save their entire family. For this comics crossover, Marvel pulled out all the stops. Not only does Earth-616 Spider-Man team up with fan favorites Miles Morales and then-newcomer Spider-Gwen, but he meets a variety of Spider-Men inspired by the character’s past throughout comics, including Cosmic Spider-Man, Spider-Man India, and Ben Reilly, Peter’s clone. This is just the tip of the iceberg, though: the comic also features crossovers with the various cartoon show Spider-Men, Peter Porker the Amazing Spider-Ham, the newspaper comic strips (in which time keeps repeating itself every three panels in the tradition of daily comic strip stories), and other similarly bizarre iterations of the character. Perhaps the weirdest reference, though, is the Japanese Spider-Man television show: at a crucial part of the comic, the team of Spider-Men are rescued by Japanese Spider-Man, and his enormous robot companion Leopardon. While JLA/Avengers (or Avengers/JLA) is widely regarded as the biggest, most spectacular crossover between the two main comic publishers, and while DC vs Marvel might win the prize of being the first official crossover between the two teams, there exists within comic book canon more than a few instances of writers and artists between the two studios collaborating on stories together, without their editors’ knowledge. Such was the case with a particularly interesting story which follows the adventures of Aquaman facing off against a bizarre slime monster. At the end of the issue, Aquaman is able to destroy the monster by trapping it in space and exploding it, saving the day. In a subsequent issue of Marvel’s Submariner comic, however, a suspiciously familiar slime monster appears through a hole in reality after having been exploded in outer space. Returning to Earth, the monster finds itself facing off against Namor, who again manages to defeat this foe. This crossover was not sanctioned by any of the higher-ups at Marvel or DC, and went completely unnoticed by both publishers at first – it was a case of the creative teams behind the two books wanting to create a story that connected their very similar heroes. The story has gone down in history as an example of what can happen when publishers don’t pay a close enough attention to what their creators are doing behind their backs. Perhaps the most impressive crossover in the history of comics is more interesting for the story that happened behind the scenes than it is for the comic crossover itself. The story behind this crossover revolves around Steve Gerber, the original writer for Marvel’s Howard the Duck comic, and the co-creator of the character. After being fired from Marvel, Gerber sued the company over the rights to Howard the Duck; an action which won the support of much of the comics community. Famous artist Jack Kirby even worked with Gerber to create Destroyer Duck, a character whose comics were used to fund Gerber’s lawsuit. The matter was ultimately settled out of court with Marvel retaining the rights to the character, but Gerber returning periodically to the company to write Howard’s comics. At one point, Gerber was approached by Marvel to write a Howard crossover comic. This was during the notorious ‘Clone Saga’, in which Spider-Man had been replaced by a clone in a move that many comics fans felt was ridiculous. Gerber agreed to write the crossover, as long as he’d also be able to bring in Destroyer Duck and another character from Image Comics, Savage Dragon. The crossover featured two issues, one in a Spider-Man comic which told the story from Spidey’s (clone’s) perspective, and one issue which told the story from the perspective of Destroyer Duck, which was published by Image. At one point in the story, the villain (the hilariously named ‘Elf with a gun’) sets a flock of Howard the Duck clones loose on the heroes. In the Marvel comic, Spider-Man and Howard escape from the clones and carry on with their respective adventures. In the Image comic, though, a small panel near the end of the book shows Spider-Man grabbing hold of the wrong Howard – the real Howard is taken back by Savage Dragon and Destroyer Duck, where he joins the witness protection program and takes on the name of Leonard. Leonard the Duck became a new character within Gerber’s work for Image comics. Meanwhile, Marvel is left with a clone of Howard filling in for him, in a story which directly parodies the ridiculous Clone Saga from Spider-Man mythos. Thus, through writing a crossover between two key books, Gerber was able to steal back his creation from Marvel, years after failing to regain the rights through a particularly bitter lawsuit. Comic book crossovers come in all shapes and sizes. Some are bold and ridiculous, while others take themselves deadly serious. No matter the tone of the story, though, the best crossovers are the ones that perfectly bring together the traits that make individual characters worth reading about. What are your favorite comic book crossovers? Which characters do you want to see together in comics? Share your thoughts in the comments below.